FIVE DUBLIN FIRE fighters had an unusual call last night when they helped a woman deliver her new baby in her car at the station. According to Dublin Fire Brigade, its Rathfarnham crew delivered the baby in the back of its mum’s car, which had pulled into the front of the station at 9pm. Luckily, the team – who are all trained paramedics – had just returned from a call, so were there to respond when the expectant mother arrived. She gave birth to a healthy baby girl at the station and mum and child were brought to hospital. Brian Tracey from DFB said there were five paramedics and one advanced paramedic in attendance, and that the mother was “brilliant” throughout the whole thing. The baby and mum have been invited to the DFB’s upcoming open day. 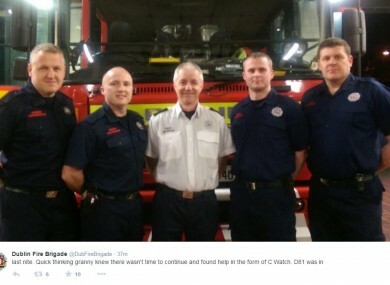 Email “These fire fighters delivered a baby in its mum's car at the station ”. Feedback on “These fire fighters delivered a baby in its mum's car at the station ”.